Wall Outlet Mini Safe | OhGizmo! At times something well hidden can be almost as secure as stashing it away in an actual safe. Once installed this Wall Outlet Mini Safe looks like an ordinary power outlet (though all the outlets I’ve ever seen have the ground on the bottom) but is able to pull out from the wall and store some of your smaller valuables. While the Outlet Safe can be ‘locked’ so that it doesn’t just fall out of the wall at an inopportune time, the lock itself doesn’t actually use a combination or unique way to secure it. So odds are if a would-be thief were to stumble across the Outlet Safe its contents would probably be as good as gone. 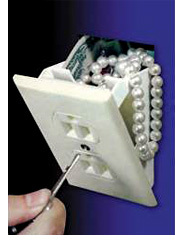 The Wall Outlet Mini Safe is available from Boomer Gadgets for only $9.95. Actually just started house hunting and found it common with newer places to put the grounds on the top to represent an outlet that is controlled by a lightswitch. Finely a place to hide my one dollar bill, and my fake pearls! This has only been available for the last 30 years. Sheesh! The only reason that the ground is on the bottom is that it looks like two eyes and a mouth. The ground is most useful to prevent a conductor from sliding down the wall and bridging the poles.